VATICAN CITY (CNS) — Guardian angels are not the stuff of fantasy; they are really present as wise travel companions helping people navigate life’s journey, Pope Francis said. Don’t ignore the inner voice that says, “Well, you should do this.” “That’s not right.” “Watch out!” the pope said in a morning homily Oct. 2, the feast of the Guardian Angels. “It’s the voice of our travel companion. Be confident that they will take us through to the end of our lives with their advice, and that’s why (people should) listen to their voice, don’t rebel,” he said in remarks reported by Vatican Radio. “All of us, according to church tradition, have an angel with us, who watches over us, and lets us hear” deep inside, wise words meant to help people make the right choices, the pope said during an early morning Mass in the chapel of his residence, the Domus Sanctae Marthae. People shouldn’t ignore that voice “because rebellion, the desire to be independent, is something we all have and it is pride, the same thing our father, Adam, had” in the Garden of Eden, he said. “Nobody walks alone and none of us can believe we are alone” because there is always this companion right by each person’s side, he said. “Don’t rebel. Follow their advice,” he said. To turn one’s back on a guardian angel “is dangerous because no man, no woman can advise themselves. I can give advice to someone else, but I can’t give advice to myself” if it’s going to be objective and wise. Reflecting on the day’s Gospel reading (Mk 18: 1-5), the pope reminded people, especially bishops, that God wants them to be as humble and meek as children. The reading recounts Jesus’ disciples fighting among themselves over who is better than the rest. “These are the first bishops and they had this temptation of careerism, ‘Hey, I want to become greater than you. 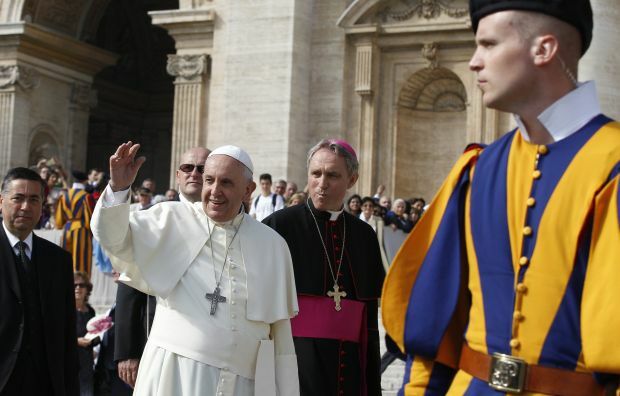 …’ It’s not a great example that the first bishops do this, but it’s reality,” the pope said. Jesus immediately shows them the right way to behave to enter the kingdom of heaven: to “become like children” and put themselves fully in the hands of God their Father. “Meekness, the need for direction and needing help” in order to go forward are all reflected in a child. “This is the path. Not who is the best,” the pope said.